Big Brother Spoilers > Big Brother > Big Brother 13 > Big Brother 13 Spoilers: Rachel tells Brendon, that since he’s acting all gangstar he needs to just tell people if they put them up …we will win POV, get off and come after them next week. Big Brother 13 Spoilers: Rachel tells Brendon, that since he’s acting all gangstar he needs to just tell people if they put them up …we will win POV, get off and come after them next week. 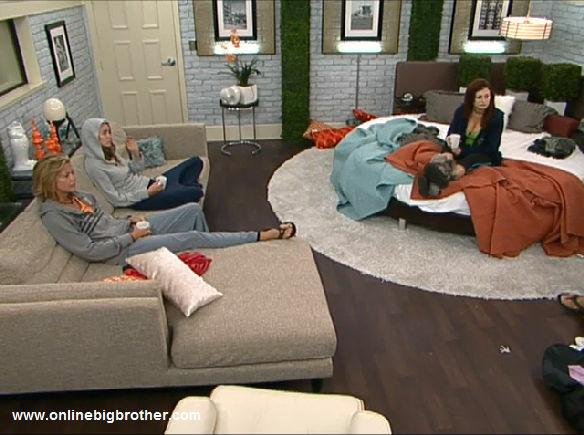 8:30am Big Brother switches the live feeds to the we will be right back screen. When the feeds come back, Shelly is out in the backyard sitting on the couch. Brendon comes out into the backyard and tells her that when he and Rachel would like to talk to Shelly and Cassi up in the HOH room. Shelly says yeah sure as soon as Cassi is up we’ll come up. Brendon tells Shelly that they don’t need to worry about anything ans that they want to talk to everyone this morning. Brendon tells Shelly that she’s awesome. Shelly tells him they are too! Brendon says that since they’ve been woken up early ..the POV ceremony will probably be early too.. so we won’t have much time to talk. TRY the Live Feeds for FREESUPERPASS – 3 DAY Trial! Dominic heads up to the HOH room. Brendon and Rachel come up right after and tell him they just want to talk with everyone quick this morning. Dominic says that you didnt put me up.. I wont put you up next week. You’re not my target and I respect that you didn’t put me up. Adam comes up and joins them in the HOH room. Brendon asks where their heads are at, who they want out ..Keith? Porsche?. Dominic says that it has changed throughout the week …and that he hadn’t heard all the conversations so he’s not sure. Adam says that he is not going to go after them next week either. Brendon says yeah we’ll play it week by week. Dominic says that he and Adam are on the same page ..they just want to play straight up ..no smoke and mirrors here. Brendon says that after Rachel and him decide what they will do …they will let them know..
Keith comes up to the HOH room. Adam and Dominic leave. Keith asks if they are still thinking of using the POV? Brendon says that they’re not sure yet. Keith says that if they do, he is willing to do anything to work with them. Keith says that he really wants to reconcile with Porsche if its possible. Keith says that he just wanted to tell them that and thats all. Brendon and Rachel tell him that they think hes a really great guy and they love him no matter what. Keith leaves. Brendon tells Rachel that they can’t get everyone to promise the world to us …we need to worry about ourselves and can’t ask everyone they can’t put up Jeff and Jordan next week too. They discuss it and Rachel convinces him that they need to tell everyone they can’t put up Jeff or Jordan either. Rachel tells him that since he is acting all gangstar he needs to just tell people if they put them up …we will win POV, get off and come after them next week. Brendon heads downstairs and runs into Lawon and tells him to head up to the HOH so they can talk and that he will grab Kalia. Lawon and Rachel chit chat …soon after Brendon and Kalia come up. 9am Lawon and Kalia are up in the HOH room talking to Rachel and Brendon. Kalia talks about how she just wants a good meal. Brendon tell her that at least she will have a mean thursday night after the competition. Rachel says that they dont have much time and need to talk. 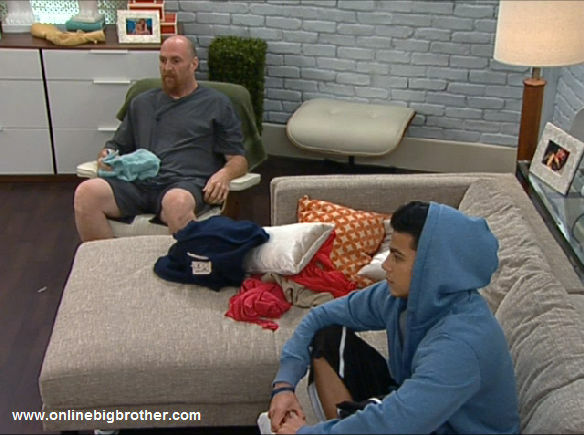 Brendon tells them that if they are safe this week they want to be safe next week as well as Jeff and Jordan. Brendon says that as it sits he thinks the house wouldn’t mind either Keith or Porsche out this week. Lawon says oh yeah, oh yeah. Brendon tell them that they aren’t a target of theirs or Jeff/Jordan. Brendon says that of everyone they trust and respect Lawon and Kalia. Brendon says that they will try and make a decision that will be best for the house. Brendon says that Lawon and Kalia are not targets of theirs and that they want them around. Brendon says that the house changes in an instant and when you’re HOH people will be telling you anything to be safe and you need to know who you can trust. ..and you can trust us (Jeff/Jordan and Brendon/Rachel). Kalia talks about how Keith did stuff that he shouldn’t have and didn’t need too.. and that he will look back after and regret the way he acted. Brendon tells them again that they aren’t their targets. Lawon and Kalia leave the HOH room. Brendon and Rachel talk …Rachel is worried about Lawon being tight with Adam. Brendon says that they will need to get Dominic out soon. Shelly and Cassi come into the HOH room. 9:15am – 9:50am Shelly and Cassi are up in the HOH talking to Brendon and Rachel. Brendon tells them that they are the one couple that they feel that they can trust. Cassi says well you’re right! Brendon tells Cassi that he is only a little worried about Dominic. Cassi says that she understands that.. but that she just likes Dominic for being able to banter with him and not in a way that she wants to have a relationship with him at all. 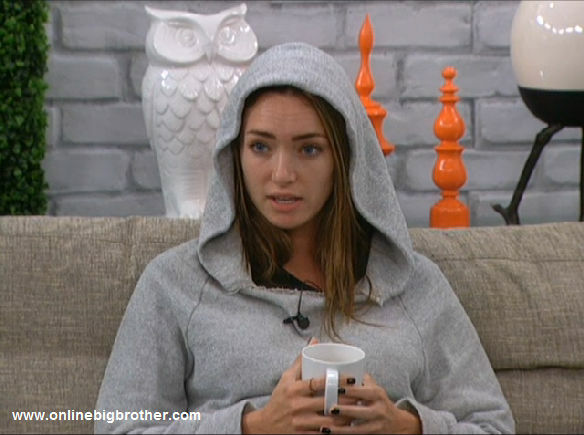 Cassi says that her only worry is that the four of them (Jeff/Jordan and Rachel/Brendon) are the scariest team. Cassi says that you all will save each other over Shelly or I. Brendon explains that once it gets done to the end at some point you just press reset and that only one person can win. They talk about how you need to play how to get yourself to the final 8, 6, 4. Rachel brings up that Dani is someone on their side too, that they don’t talk about her because she is safe for the next 4 weeks. Rachel says that we are the 7 strongest players. Brendon says that I, we are going to trust you… and that they hope they trust them too. Once that trust is broken all deals are off. I REALLY did not like how last nite on bbad shelley was all convinced that she and cassi were safe until the final 7 with the vets. Even if this supposed deal with the vets lasts it seems to me that they will end up seeming like floaters. I did like that cassi was trying to get shelley to get her head out of the safety net and said that even if the vets keep their word they need to go hard for the hoh and still worry about how they’LL be gone asap at the final seven. I really like the cassi/dom alliance so I wish shelley wasn’t so naive! Maybe i’ve missed something though. GREAT JOb simon and dawg!!! Love your site! I thought the same thing, but if you were stuck in a house with no other prospects then the people around you the best looking people would always catch your attention. That being said I don’t think Jeff is in love with Jordan, I almost feel like he’s still with her out of moral obligation… because he got some of the money and fame. The contrast in differences is kinda appearing for me and to put it nicely Jeff is too smart to stay with Jordan. But that is just me. omg! I completely agree with you, man. I keep saying the same thing. He is not that samrt himself, but he’s definitely TOOO smart and mature to be with jordan. i think he’s just with her for publciity. You never know, she probably even struck a deal with him and cbs! HAHA NeandertAAAL and Ratress are cracking me up saying last season Matt let the floaters (The Brigade lol in there warped minds) get to the end by putting B&R up on the block instead. Ummmm Just because an alliance made on day 2 doesn’t include you two and vaporizes you on there way to the win doesnt make them floaters, in fact its exactly the opposite. I don’t understand why rachel and brendon are acting like they are still going to have control next week. Jeff and Jordan are the only two can win HoH in their alliance next week. It’s classic brendon/rachel game play I’m looking forward to when the power shifts and the nasty comes out on them..
Big Brother 13 Spoilers: Porsche says that she doesn’t really care if naked photos get out of her …because her breasts are good looking..
Big Brother 13 Spoilers: Cassi asks if Dominic is done in the bathroom, he says ya.. Cassi says that doesn’t sound too confident?! He says it smells like a chocolate dinosaur..